The new and ground-breaking Scytl ePollBook solution provides electoral bodies with centralized management of election activities and unprecedented election efficiencies. The new Scytl ePollBook is a game changer for election officials. It's designed from the ground-up to deliver the synchronization performance, centralized management and insight required to truly streamline election operations. Scytl, the worldwide leader in secure online voting and election modernization, today unveiled Scytl ePollBook, an entirely new electronic poll book solution that transforms the traditional electronic poll book concept into a comprehensive precinct management system that streamlines processes, provides elections officials with real-time visibility into elections as they unfold and generates unprecedented election efficiencies. Scytl ePollBook enables election officials to load voter data and supplemental lists with the click of a button, to quickly process voters at polling stations and to instantly generate reports during and after an election. 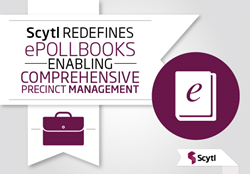 Counter to other electronic poll book solutions, Scytl ePollBook shifts the data processing load from devices in the field to a powerful underlying platform that delivers intelligent voter data synchronization and unmatched scalability. Using Scytl ePollBook’s customizable dashboard, election officials can centrally manage their electronic poll book inventory and gain real-time insight into Election Day operations. They can easily see when supplies are running low, voter check-in has slowed or additional poll books are needed. As a result, emerging issues can be proactively resolved. Unlike the current generation of electronic poll books, Scytl ePollBook is hardware independent and can run on a variety of devices and operating systems during the same election. This approach provides elections officials with tremendous flexibility, protects current and future hardware investments as well as facilitates the use of assisted technology that allows jurisdictions to engage and employ members of the disability community.